To get a idea of the challenges faced in the United Kingdom, we first looked at the local insights observed by Universum’s expert teams. Check out the findings below! Banks are the most preferred industry overall for Business students, overtaking Management and Strategy Consulting. However, male students tend to choose Banks more, with women preferring Management and Strategy Consulting. Engineering/IT students are more aligned by gender, with both most wanting to work for Software and Computer Services. Download @Oleeo_’s Must-Know Student Recruiting Trends for 2018 and find out what was discovered in the #UKTweet This! In whole, UK students are interested in doing a graduate program. Business students most want business integration, development and mentorship. On the other hand, Engineering/IT students value development, mentorship and variety of rotations. After graduation, UK students most want to work for an international company/organization or to continue studying. When it comes to size of employer students prefer, we see differences between genders. Male students prefer macro employers (1000+ employers) whereas female students would want to work for a medium-sized employer (100-499 employees). The biggest reason that students do not pick companies as ideal employers is because they do not know enough about them, followed by the feeling that they are not qualified to work there and that the jobs tasks are not appealing. Oleeo sought to examine the key findings identified by Universum and analyzed 350,000 graduate applications spanning financial services, public sector and retail employers. Before revealing the results noted by the Oleeo investigation, it is helpful to understand more about the preferences of 8,677 business students surveyed by Universum. Wondering why #UK students choose one company over the other? 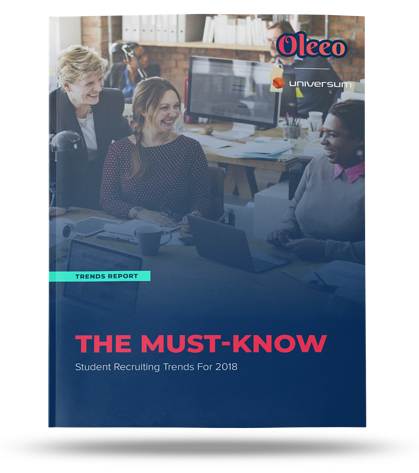 Find out in @Oleeo_’s Must-Know Student Recruiting Trends for 2018 report.Tweet This! Although the numbers of graduates in the UK being hired is showing year- over-year increases, competition to join a dedicated program is intense. The biggest recruiters are seeing between 30-60,000 applications a year and only one or two percent reach the offer stage. Males dominate the gender mix across all sectors both in terms of applications and hires. The numbers of females being hired in 2017 overall is increasing, but there is still large statistical gaps. The use of screening is less prevalent in the UK than in other global markets. For the most part, UK employers only halve their applicant numbers using screening with few exceptions. Decline rates in the UK are lower than other nations, as are reneged offers and application withdrawals indicating candidates are largely invested in a future employer once they feel they would be a natural fit into the business. Analysis on the universities where successful students come from shows some level of unconscious bias. On average, three quarters of successful applicants were from one of the 24 elite universities who are members of the distinguished Russell Group. More could be done here to expand sources, find diamonds in the rough and improve diversity. For recruiters who report on ethnic minority using the Oleeo system, the data analyzed shows large gaps in the numbers of applicants classifying themselves as ‘Black’ in the UK (only around 20% are successful) compared to the larger numbers of White or Asian successful candidates. As noted in the introduction of this report, we have also looked at the migratory patterns of applicants stretching over 200 countries. From the data scrutinized for the UK, we found that between 40% and 50% of applications come from candidates living outside of the United Kingdom. Interestingly of these candidates, the success rate is also in the high forties – despite uncertainty driven by Brexit. 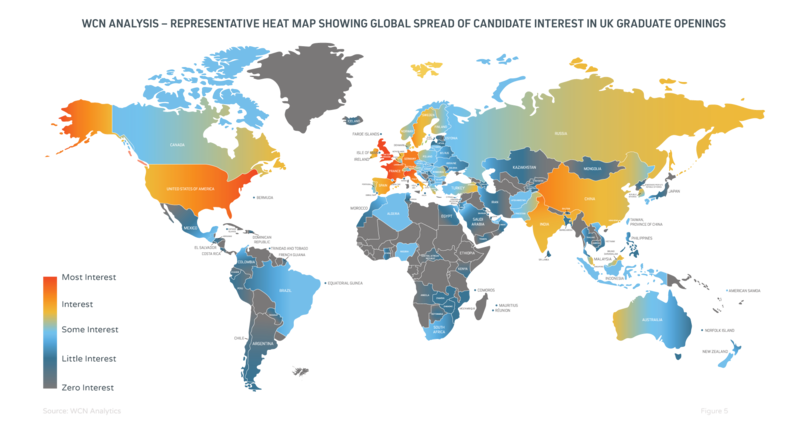 This illustration shows a heat map showing this international split. How can employers be better at engaging these applicants and being sure that they are winning the war for talent? Universum research looked at the most used and most effective communication channels and found the top 10 consisted of the types shown below. 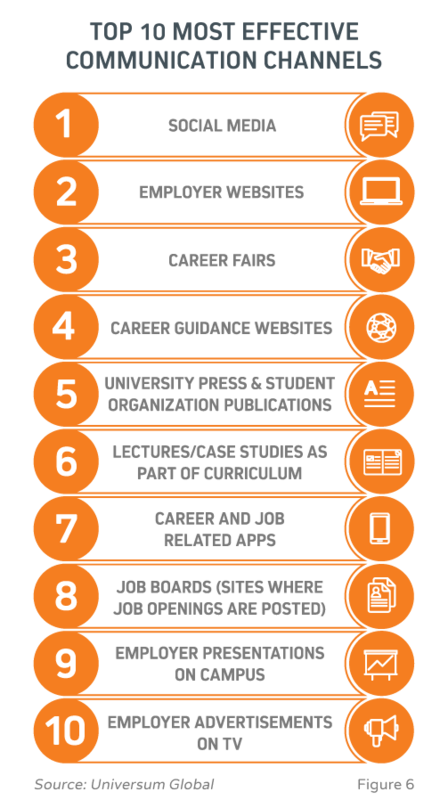 Career goal messages around work/life balance, job security and stability and the ability to become a leader or manager of people with an international career possibility were the most highly desired among business students. This was reiterated by leading employers in the UK. Nuclear Decommissioning Authority - a public body set up by the Government to ensure the safe, accelerated and affordable clean-up of the UK’s civil nuclear legacy. This is explained further in the following case study. 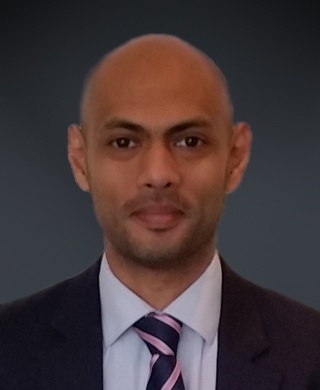 Newton Europe is another business that actually wanted to increase its applications without sacrificing candidate quality. Nucleargraduates runs an extensive recruitment process using the Oleeo ATS and needed to make it highly engaging and as straightforward as possible. This included bespoke application forms & online tests for candidates to provide information on academic qualifications and work experience as well as verbal, numerical and logical reasoning and situational judgment questionnaires. Successful candidates can then complete a 15 minute online video interview at a time / location convenient to them on any device before being invited to a two day assessment center with feedback recorded at every stage. Complementing the application journey, nucleargraduates makes sure to reach out to students in their talent bank with a ‘Footprints’ CSR program that allows graduates to ‘give something’ back / fulfill their sense of civic duty. The process is designed to allow top candidates to develop their own program to suit their individual needs / desires by offering a variety of work, training and experience and the opportunity to build network of contacts / exposure. For a lucky few, international opportunities and professional development is also on offer. Download The Must-Know Student Recruiting Trends for 2018 report and investigate this trend further to see how current recruiting insights can be improved upon by looking to engage and influence the best hires before competitors by devoting more time on focused value add activities.